Beautiful landscaping can create relaxing spaces, boost curb appeal, and increase the value of your home. The possibilities are nearly endless, and the staff at Lakeview Garden Center and Landscaping in Fairfield, OH, advises that if you’re looking to take your landscape design to the next level, adding water features is the way to go. Ponds, waterfalls, and other aquatic elements can have a significant impact on outdoor spaces, so consider the benefits below. Well-designed landscaping immediately makes your home more valuable, so it’s especially important if you’re looking to sell. For even more value, add water features. While the initial investment of piping and installation can vary based on the intricacy and design, you’re ultimately adding lasting aesthetics that become an amenity many homes don’t have. Water features, when kept clean, will attract wildlife—birds especially. By adding a resource to your local ecosystem, animals that need water will visit, relax, and may even nestle down. Don’t worry—this doesn’t mean you’ll have larger animals or invasive insects. In most cases, predators and larger game stick to natural water sources away from homes, and problematic insects are no more likely to nest near well-designed water features than they are regular landscaping. Water sounds drown out noise pollution and create relaxing background noise. Whether you’re by yourself or hosting family and friends, water features enhance any entertainment space, creating a better environment for everyone, as well as something for them to enjoy. You may even notice a reduction in stress and anxiety because flowing water emits negative ions that calm the mind. 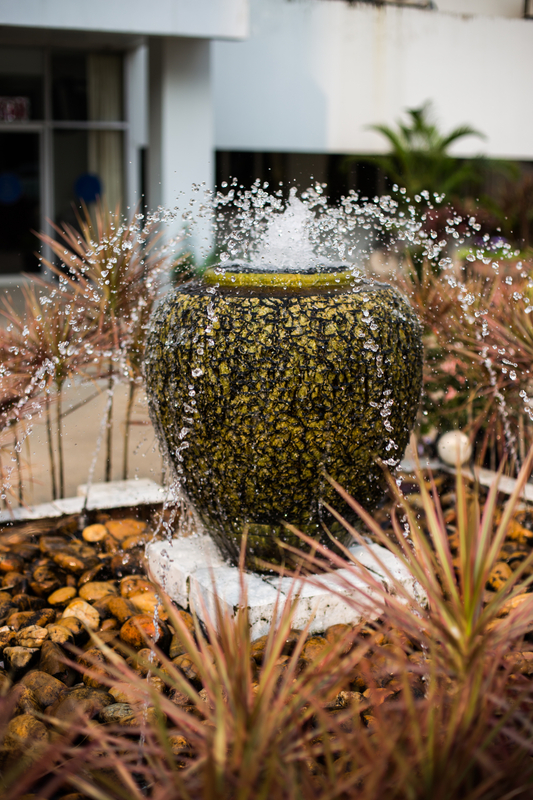 If you’re ready to add water elements including fountains and pondless features, as well as ponds to your landscaping, turn to the professionals at Lakeview Garden Center and Landscaping. Their landscape design team is happy to offer ideas and assistance for getting started or expanding your landscaping, and they carry all the gardening accessories and lawn care products needed for the job. Call (513) 829-6624 today to speak with their staff and visit their website and Facebook page to learn more. FABULOUS FEBRUARY FERTILOME 3 STEP FERTILIZER PROGRAM SALE! Business does close early on occasion due to inclement weather. Call for holiday hours.